Paris real estate is cheaper on the outskirts of the 12th arrondissement. It was a grey Saturday morning in December when we got the knock on the door we’d been dreading. It was the mail carrier delivering a registered letter from our landlord. It informed us that he wanted to reclaim our apartment for family use and we had six months to leave. Though the news was not entirely unexpected, we were stunned. Our apartment. The first and only place we’d lived in Paris. When we arrived from New York City 12 years ago, we could scarcely believe our good fortune in landing this place. Back in New York, we’d paid a shade under $2,000 a month for a 600-square foot, one-bedroom apartment and counted ourselves lucky. Here, for just a few hundred dollars more, we had a 1,200-square-foot, two-bedroom in the center of Paris. A gorgeous, wrought-iron balcony wrapped around the apartment and almost every room had floor-to-ceiling windows, hardwood floors, and marble fireplaces with gilt-framed mirrors. From my living-room window, I could gaze at the famous bateaux mouches passing by on the Seine and contemplate the slate turrets of the Conciergerie, where Marie Antoinette was imprisoned. The Louvre was a five-minute walk away. But its beauty wasn’t the only reason we loved the apartment. We loved it because it was our home. It was in this place that we celebrated becoming engaged…decided to quit jobs and take new ones…walked our newborn children to sleep over creaking floorboards…hosted countless parties and dinners. And now we had to leave. At first we could barely talk about our options, so heartbroken were we. But for me, there was only one real option: to buy. Buying a place in Paris would both cement our relationship with the city and be a conscious reaffirmation of our life as expats. Plus, I could not bear to think of falling in love with another place, only to get kicked out again. As it turned out, our landlord’s timing wasn’t bad. Now is a pretty good time to buy. Thanks to a weak economy and the flight of the wealthy to tax-friendlier countries, housing prices in most parts of Paris were (and continue to be) on their way down for the first time in over a decade. According to a recent Bloomberg news report, Paris prices fell by 2% in the last quarter of 2012 and sales volume is down by 20%. What’s more, prices are likely to fall further over the next year. We saw plenty of evidence of the change in the real-estate atmosphere during our four-month search for an apartment. Although we had been warned by friends that Parisian owners don’t negotiate, we were happily surprised to find many owners open to negotiation. We also noticed that apartments that lingered on the market for more than a few months often dropped their prices, sometime by as much as 10%. Another boon for us, timing-wise, was the record low interest rates. We were able to score a 2.95% interest rate on our 25-year loan (I’ll tell you how later), which is, as one banker friend put it, practically like getting an interest-free loan. All this is great news if you are a prospective buyer here. In less-swank parts of the city, such as the 19th and 20th arrondissements or the outskirts of the 12th arrondissement, average prices are more reasonable, at $6,500 to $8,500 per square meter (or about $604 to $790 per square foot). If you’re patient, you can probably find apartments in almost any neighborhood for less than their average per-square-meter price. Some owners are looking to sell quickly and are willing to negotiate. Or the building may have less-than-ideal features, such as no elevator, which usually brings the price down. 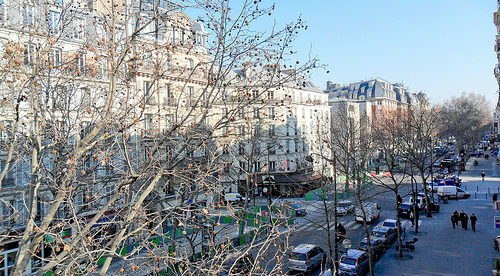 To figure out approximately how much a particular property is worth in Paris, consult the website MeilleursAgents.com. On this site, you can enter the address of the building, give apartment details such as the size, number of rooms, and so forth, and it will calculate the estimated worth of the apartment. At the very least, it can give you a good idea as to whether the asking price is reasonable or overinflated. During our four-month search, we visited more than 40 apartments. Like most people, we started our search online through real-estate sites such as Seloger.com and Immostreet.com, on which you can define your search by price, square-meter size, and arrondissements. He was right. We began targeting agents in the neighborhoods we liked, calling them up and dropping by, reminding them of the type of apartment we wanted and of our budget. Within a week or two, the calls started coming. “We’ve got a place…,” or “Just on the market today, I thought of you as soon as I heard…” In the end, we found our new apartment just this way. It had recently come on the market; we were one of the first to see it. If you’re doing your search from abroad, don’t fret. The essential point is still the same: Develop a relationship with your real estate agent. Keep reminding them of what you want and that you’re eager to buy. In the end, we found exactly the kind of apartment we were looking for: a classic 19th century Haussmanian with soaring ceilings, huge windows, marble fireplaces, and the kind of beautiful, ornate ceiling molding that makes you feel as if you’re in Versailles. In other words, it’s much like the one we have now. The only difference is that this apartment isn’t located on the banks of the Seine, but deep in the heart of Paris, near the trendy Canal St. Martin/République area in the 10th arrondissement. The apartment is 215 square feet larger than our current one and less than 10 minutes away on the metro, but there’s a $400,000 price differential, if not more. That’s the cool thing about Paris: It’s so small that reasonably priced neighborhoods are close to prohibitively expensive ones, so you can get the same benefits for much less money. I’m still a little sad to be leaving our old apartment, which holds such wonderful memories. But I feel as if I’m finally entering the “real” Paris—not “Postcard Paris,” as I used to call our old neighborhood. It’s fitting, I think, to start this new chapter in my Paris life away from all the never-changing touristic monuments, but in the beating, evolving heart of the city. Maybe it means I’m a real Parisian now. • Be ready to make an offer when visiting. In Paris, good apartments get snatched up quickly. We learned this the hard way during our first week of searching. We found the perfect apartment but made the mistake of hesitating over the price for 48 hours. By the time we decided to go for it, it was already gone. Weeks of regret ensued. We later learned we should have made an offer, even if we weren’t 100% sure that we wanted the apartment. Making an offer on a property in Paris puts you first in line to buy, yet it doesn’t actually commit you. You’re only legally committed to buy once you sign the compromis de vente, the contract in which you hand over your deposit and promise to buy the apartment. And even then, you can retract in the seven days following the signing of the compromis without losing your deposit. • Factor monthly charges into your monthly costs. Most properties available in Paris are apartment buildings. This means that you’ll have to pay a monthly charge to cover your share of the building’s upkeep costs. Compared to other major cities (such as New York), these communal charges are relatively low, typically ranging between $200 and 300 per month. • Ask about upcoming building expenses before committing to buy. Many Parisian buildings were built in the 19th century or earlier and are still being modernized. A typical expense might be the installation of an elevator or roof repairs, both of which can substantially add to the purchase price. Also, because Paris requires the façade of every building to be cleaned, painted, or sand-blasted every 10 years, you should ask when the next ravalement (cleaning) is expected. The best way to find out this kind of information is to ask for the minutes of the most recent meeting of the assemblé generale: the meeting of the co-owners.